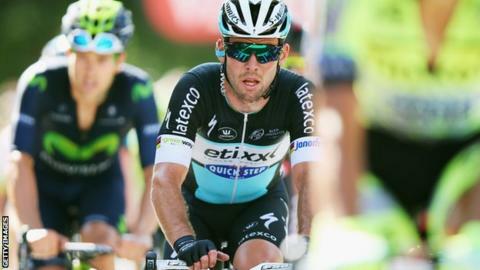 Britain's Mark Cavendish has been ruled out for the rest of the season after having shoulder surgery. The 30-year-old Etixx - Quick-Step rider suffered the injury on the sixth stage of the Tour of Britain earlier this month and withdrew from the race. It is not the same shoulder he injured at the 2014 Tour de France. "It has been a very difficult decision," said Cavendish. "The surgery was necessary to avoid any problems in the near future." Cavendish pulled out of the UCI World Road Race Championships, which run until 27 September and said he was "disappointed" to miss that event as well as the Abu Dhabi Tour in October. He was taken to hospital after hitting a parked car in the stage from Stoke to Nottingham during the Tour of Britain. He sustained bruising but there was no fracture or dislocation of the shoulder joint. In July last year he dislocated his left shoulder and suffered ligament damage during a crash near the end of stage one of the Tour. Cavendish, from the Isle of Man, added: "After 10 days from the crash, I still had pain and I couldn't lift or pull much weight. "I tried to ride my bike a few days ago on the road, but I could not put any power out by pulling on the handlebars. "There's nothing I can do now except take a period of rest, and then start with intensive rehab."